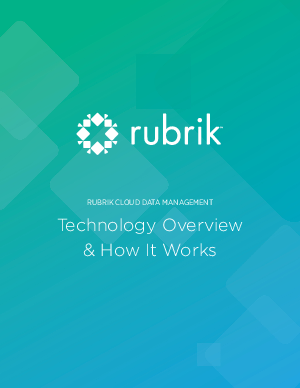 Rubrik Cloud Data Management is a single, unified software platform to manage your physical, virtual, and cloud data. With Rubrik, enterprises can drastically simplify their data protection processes, automate workflows, and migrate data to the cloud. The results are powerful: faster recoveries, easier management, no forklift upgrades, and hard dollars saved for other projects. Organizations pursuing cloudfirst policies can use Rubrik to archive to the cloud, create cloud DR capabilities, or perform cloud-native backup. And with Rubrik’s Polaris SaaS platform, it has never been easier to unify data across data centers and clouds, simplifying operations and governance.